Reading Transport Fleet List: 83-87 have been sold to Shamrock (the current owners of ex751/2) and are due to leave the fleet very shortly. 82 may also follow, although it is not part of the initial sale. 626/8 have been sold to a buyer in Scotland, with 624 due to move to Newbury to replace them. 77/8 have been sold to Transline, and are not now going to be replaced at Goldline following the loss of the BCA contract. 703 is currently at Scania for repairs, and then it will pass to Yorkshire Traction. An exdemonstrator Scania OmniDekka has been purchased as a replacement, and is expected to take generic livery. Stagecoach in Oxfordshire and Warwickshire Fleet List: 40150 has gone into use at Nuneaton. 20213 and 20226 have new MegaRears for Ropewalk Shopping, 20213 previously having one for Birmingham Bull Ring. Thanks to Tim Moss for this. 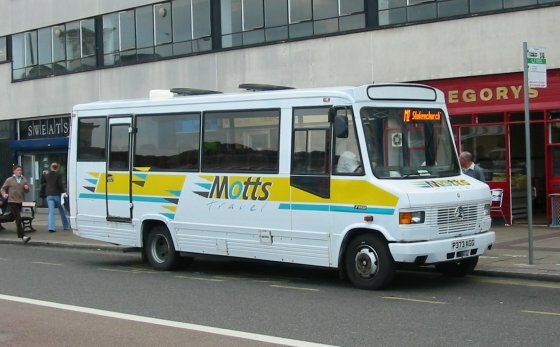 Reading Transport Fleet List: 12/14-17, 82-87, 77, 78, 193, 201, 311, 313 and two MetroRiders (possibly 624 and 626) have been advertised for sale in the trade press. The Olympians are stated to be available in batches between now and March 2006, but the others seem to be available now. Thanks to Ian Dyer for this. With 82-86 in reserve (and probably 87 too - although all six remain licensed for use if absolutely required) it may therefore be that these will depart before the arrival of the next OmniDekkas. Courtney Coaches Fleet List: Former R430 DGU has finished up with Verma, Southall, whilst Y8 CCL has been sold to Ford, Althorne and YN04 GLK to Hearn, Harrow Weald. Thanks to Derek Bradfield for this. First Berkshire Fleet List: 43835 has been repainted into corporate livery, formerly in Airoute Link livery with a MegaRear for Queensmere/Observatory. Thanks to Stephen Le-Bras for this. Stagecoach in Oxfordshire and Warwickshire Fleet List: 13625 is confirmed back at Leamington, having only been on loan to Bluebird in July/August. 13650 will therefore be a fourth bus for The Green Bus Company. Stagecoach in Oxfordshire and Warwickshire Fleet List: 16514, 16516, 16517, 16618 and 16620 have been repainted into pink with 16618 and 16620 loosing their respective Stagecoach UniRider (female) and Stagecoach UniRider MegaRears and 16514/7 their X1 branding. The green school buses are to operate as 'The Green Bus Company', with 13650 also looking likely to receive the livery. 13625 is still shown on the official allocation for Leamington, so may return from Bluebird. Stagecoach in Oxfordshire and Warwickshire Fleet List: 14515 has transferred from Leamington to Nuneaton, and withdrawn 20402 from Leamington to Cheltenham. 14937 is at Rugby rather than Leamington as previously reported. Stagecoach in Oxfordshire and Warwickshire Fleet List: 13644 has transferred from Manchester to Leamington for the new King Edward VI school contract in Birmingham starting in September, and is currently away for repaint into a new dedicated green/red livery. 13647 has also recently received this livery. Meanwhile 13605 has transferred from Leamington to Manchester. First Berkshire Fleet List: Three new Scania L94UB / Wright Solars have been ordered for the Madejski Stadium park and ride. The vehicles are expected to be delivered in the next month and will wear a revised livery. First Berkshire Former Vehicle Fleet List: Some past and present vehicles in the training fleet that have previously unrecorded national fleet numbers allocated are LS497 - 90161, M1328 - 90163, M1338 - 90165, M1418 - 90170, M1419 - 90171 and MB512 - 59991. LS470 and M1420 had been in store at Bracknell after being withdrawn from Slough in April 2003 and July 2004 respectively. It is not known exactly what role MB512 played in Berkshire, but it was allocated to Uxbridge by 23th July 2005. Thanks to Mac Head for this. Courtney Coaches Fleet List: Two further Alexander Enviro 300s have been ordered, but with East Lancs bodywork - the first ever to be specified without Enviro bodywork. The four Alexander bodied examples already on order are expected shortly for the start of the new school term in September. Thanks to Derek Bradfield for this. Stagecoach in Oxfordshire and Warwickshire Fleet List: 40150 returned to store at Nuneaton today from loan to Oxford. Thanks to Tim Moss for this. TWM Details: The official code for Bordesley Garage has been changed from HY to BY. Thanks to Tony Hunter for this. Reading Transport Fleet List: Sixteen 10.6m Scania OmniDekkas have been ordered for delivery in March to convert routes 25/44/45 into Premier Quality routes. They will take fleet numbers 818-33 and replace 11-17 and 82-7. In addition 701-2 and one other Spectra will be used to replace 77-8 and 193 in the Goldline fleet. It is also rumoured that some of the new Scania K260UBs currently under development may be purchased to replace the Thames Valley Park Excel2s upon renewal of the contract. Reading Transport is believed to be a lead customer for both this vehicle and a new East Lancs bodied MAN double decker currently under development. First Berkshire Fleet List: 42417 has been repainted into First corporate livery, leaving just 43835 in BoroughBus Airoute Link livery. Thanks to Stephan Le-Bras for this. Withdrawn 45410 was towed away from Bracknell on 10th, LS470 on 9th, and M1420 on 11th. Thanks to Mat Wooll for this. It appears that LS470 and M1420 had been at Bracknell for an unknown period rather than Slough as previously shown. Stagecoach in Oxfordshire and Warwickshire Fleet List: 14937 has transferred from Stagecoach East back to it's previous home of Leamington to operate an additional school contract from September. Thanks to Terry Wightman for this. 13650/1 are thought to have transferred from Manchester to Leamington also for use as school buses from September. First Berkshire Fleet List: 43834 has been repainted into First corporate livery, previously wearing Airoute Link livery with a MegaRear for Queensmere/Observatory. Thanks to Stephen Le-Bras for this. Stagecoach in Oxfordshire and Warwickshire Fleet List: 47026 has lost it's CHAT! branding pending a new version of the livery to be applied as part of the revisions to services to Camp Hill from 4th September. 31333 has transferred from Leamington to Nuneaton and 40147 from Nuneaton to Leamington. 41505 is now withdrawn at Nuneaton. 16615/7 have been repainted into pink, both loosing their MegaRears in the process - 16615's being for Touchwood in Solihull and 16617's for Stagecoach UniRider (female). Thanks to Tim Moss for this. Stagecoach in Warwickshire Gallery 2003: Page name corrected so links to the page now work! First Berkshire Fleet List: Withdrawn 65626, 65628 and 65631 have transferred to First Essex with 65627. Thanks to Mat Wooll for this. Weavaway Travel Fleet List: B10 MKC is another sold to Bob Vale (dealer), departing yesterday. Thanks to Derek Bradfield for this. Weavaway Travel Fleet List: B10 MKF has also been sold to Bob Vale (dealer). Thanks to Derek Bradfield for this. Reading Transport Fleet List: 104 has returned to Reading from loan to Newbury. Thanks to Michael Todd for this. Weavaway Travel Fleet List: NDZ 70 has been reregistered back to YN53 EHZ, whilst YN04 WTD has been reregistered NBZ 70, and YN04 WTD has taken NDZ 70. All these plus YN53 EHY were changed on 28th July. B10 MWA and B10 MBD were sold to Bob Vale (dealer) last week. Thanks to Derek Bradfield for this. Stagecoach in Oxfordshire and Warwickshire Fleet List: Reserve 41505 is in store at Leamington rather than Nuneaton. Thanks to Tim Moss for this. 16515 has been repainted pink. Weavaway Travel Fleet List: NBZ 70 has been reregistered back to YN53 EHY. Thanks to Derek Bradfield for this. 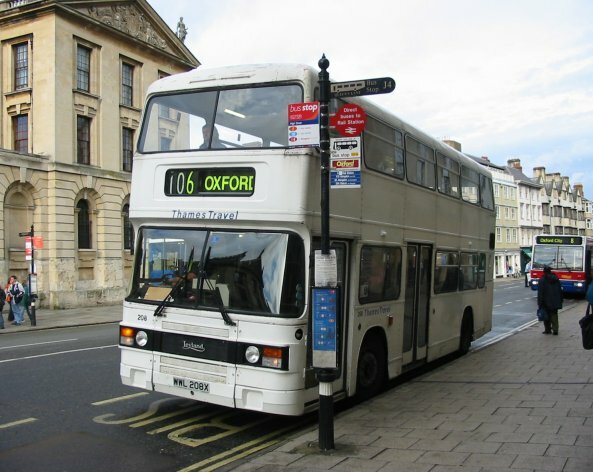 Stagecoach in Oxfordshire and Warwickshire Fleet List: 13614 has been swapped for similar 13647 from Manchester. 14386 has lost it's MegaRear for Coventry City Centre Shopping. 40152 returned to service at Nuneaton by December 2004, and does not appear to have been used at Rugby as previously shown. Thanks to Tim Moss for this. 16619 is away for repaint into pink, loosing it's Stagecoach UniRider (male) MegaRear.